Have you ever started a recipe only to find the next step needs half an hour for the dough to prove or it needed to be done the night before? To avoid the stress of this happening always check the total cook time of a Thermomix recipe. The active cook time may be nice and short (and that’s what we love about using a Thermomix) but cooking can be a fine art and there are some steps that need more time before the master piece can be created. This time is always included in the total cook time of a recipe in a Thermomix cookbook or recipe chip. Knowing the total cook time can help avoid headaches and by meal planning you can see what steps you can start a day or two before. This is especially useful when you are cooking multiple recipes for an event. 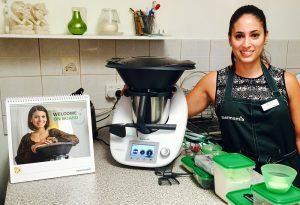 Meal planning will also be made a lot easier when the Thermomix Recipe Platform is released soon. It’s going to be great!